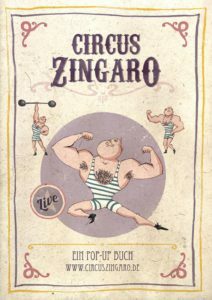 In this review we are going to take a closer look at a very special and unique pop-up book titled Circus Zingaro – A Pop-Up Book. You may have noticed that we totally support independent (Indie) projects by Paper Engineers. In this case we would like to say “Indie publisher” but unfortunately it haven’t gotten that far yet for this book. 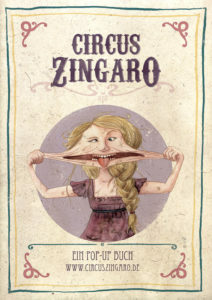 German Paper Engineer Tina Kraus, who engineered and illustrated Circus Zingaro, once started it as a project for her final exam. In the years that followed, Tina improved the book and finally shared a video of the finished project. Or should we say product? 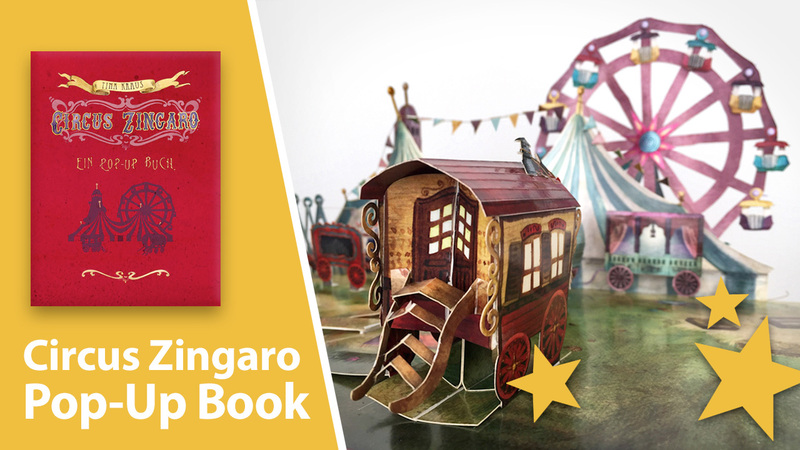 When we started BestPopUpBooks as a website and YouTube channel, Circus Zingaro was one of the first videos on YouTube that grabbed our attention. It popped-up next to our videos as a recommendation and after seeing the video, we got all exited about the idea of making our own video review about this beautiful piece of art and paper engineering. Tina was so kind to send us the one-and-only copy of her creation so we could capture it for our channel. Little did we know that the video we wanted to make would become the longest of all videos on our YouTube channel! 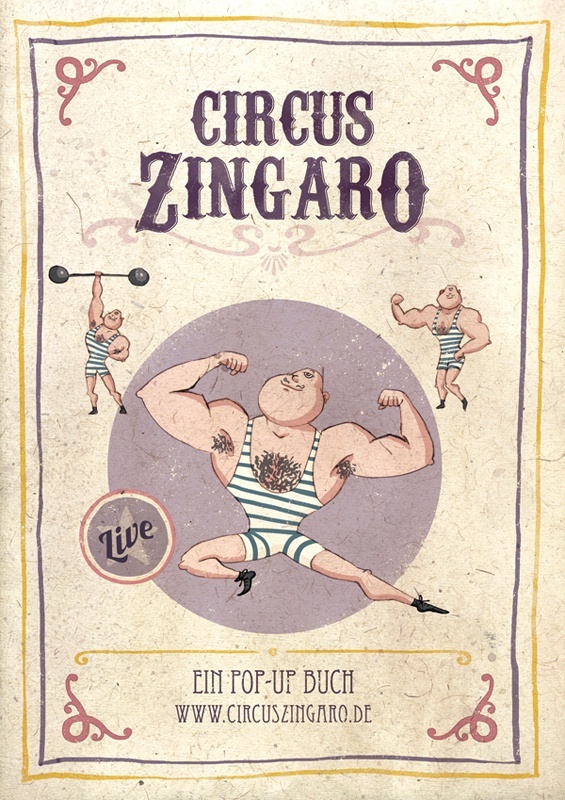 So you could say that Circus Zingaro is a pop-up book with two stories. 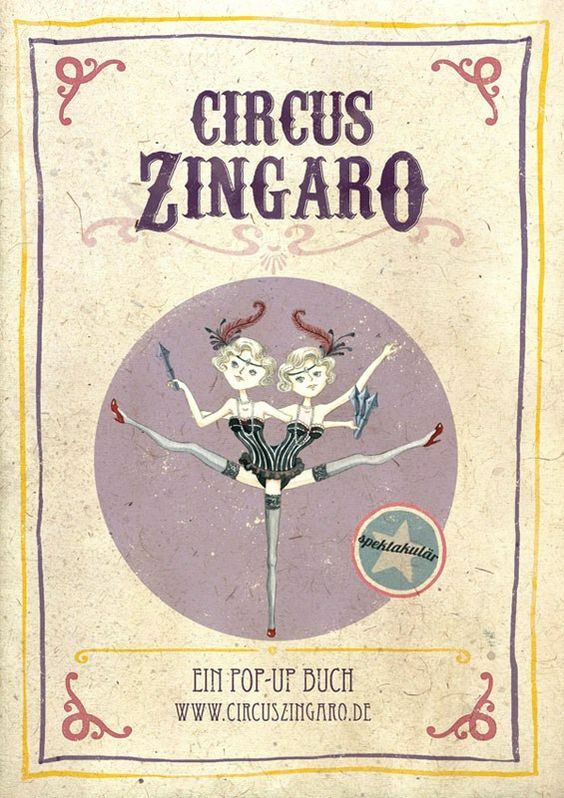 Before we dive into the main story, that is about a homeless girl that wants to join a mysterious traveling circus, we would like to focus on the “second story”. The story about how this book gathered a fanbase without being published and why it became a very popular pin on Pinterest and one of YouTube’s firsts pop-up book video with lots of views, likes and comments. We have already seen some successful pop-up book indie publications like TRIAD, What a Mess! and The Pop-Up Art Book. Being an indie publisher demands a lot of dedication. It’s a fulltime job to arrange production, marketing, PR, shipping and aftersales. What most people don’t realize is how much work and time it takes to do all this by yourself. 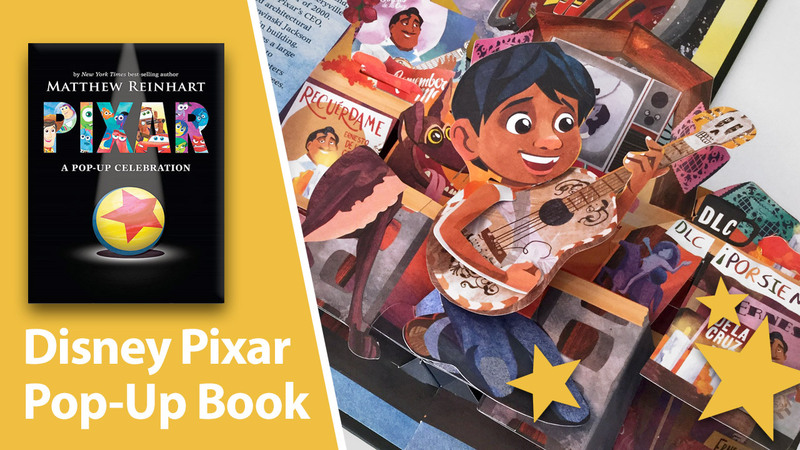 Although websites like Kickstarter make life a lot easier by providing a crowdfunding platform for Indie publishers, it’s still a lot of work to reach your goal and get things going to make a published pop-up book reality. That’s where most Paper Engineers get stuck and a pop-up publisher comes in handy. 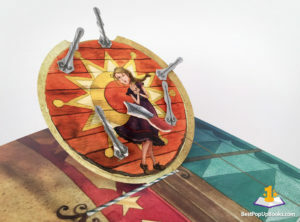 On the other side, pop-up book publishers are hard to find. 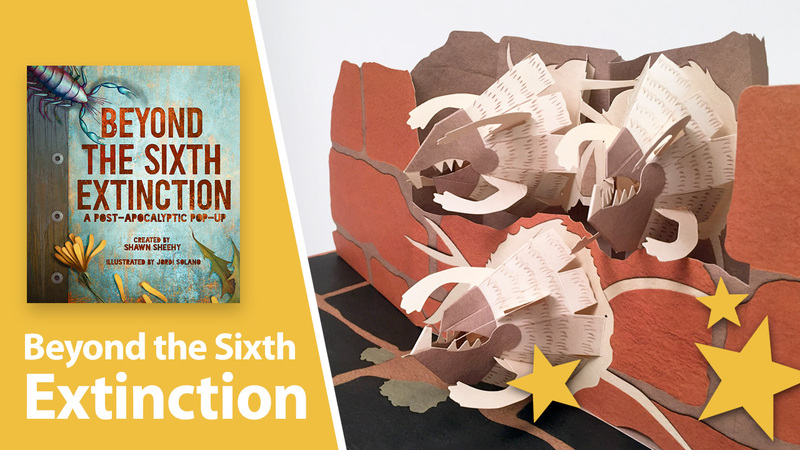 The process of manufacturing a pop-up book is time consuming, complex and very expensive. 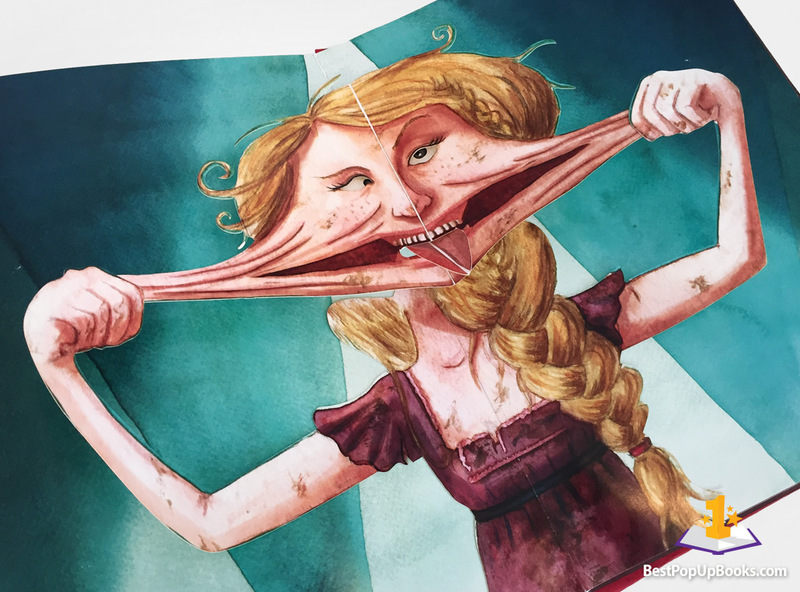 That is why pop-up book publishers are strict when it comes to selecting a book to publish. 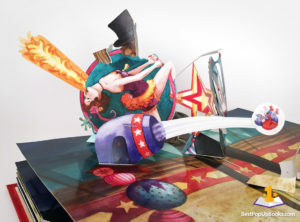 How expensive is it make a complex pop-up book with a lot of glue points and movable mechanisms? Is there an audience out there for this kind of product and are they willing to buy it once it’s published? 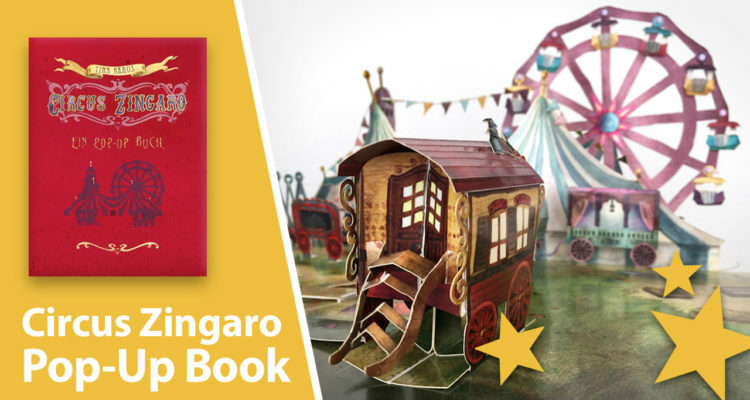 The paper engineering in this book is a fun combination of both movables and pop-ups. The interaction with the movables creates almost a real circus with tricks and effects. And the fun part is that you’re in control! 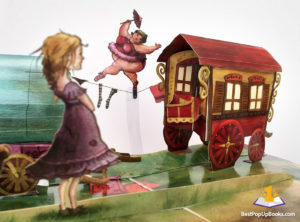 All pop-up’s are solid and sometime create complete stages with 3D objects and working acts. 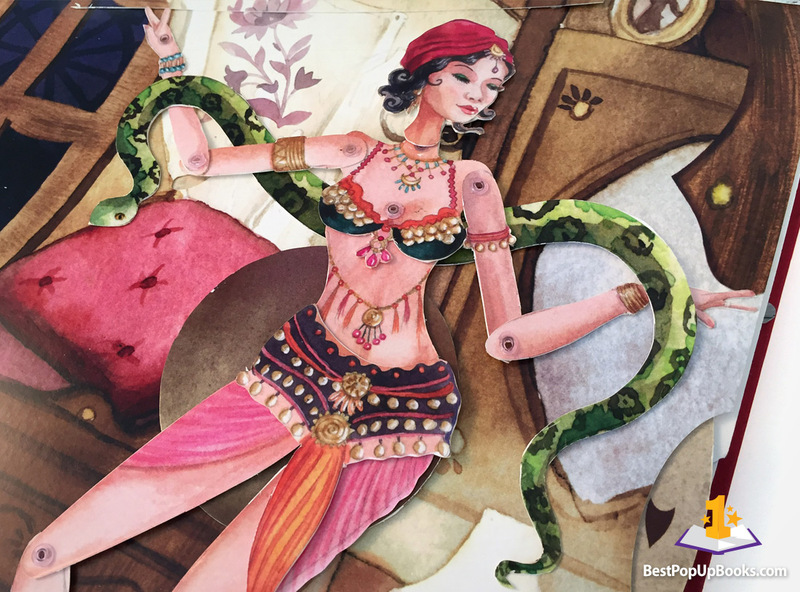 There’s real tightrope walking, magical disappearances, belly dancing, knife throwing and so much more. The pop-ups and movables are a tasty blend of classic and new-school paper engineering. All pop-up spreads work great, create a lot of depth and pop-up in all directions. The way the belly dancer moves is organic and hypnotic. 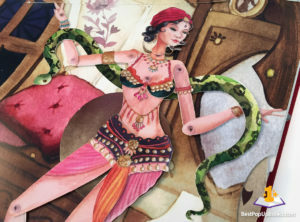 The Snake Lady that is hidden in a box is a perfect example of how to re-use an old technique in a very original way. Minuscule split pins and rivets, that are used to make most of the mechanics rotate, work solid and smooth. It makes you wonder what is happening inside the pages to make such movement possible? There’s also a fold-out scene that gives you an insight look in one of the gypsy wagons, which is huge and folds out as a fully furnished caravan. It’s all in this book! 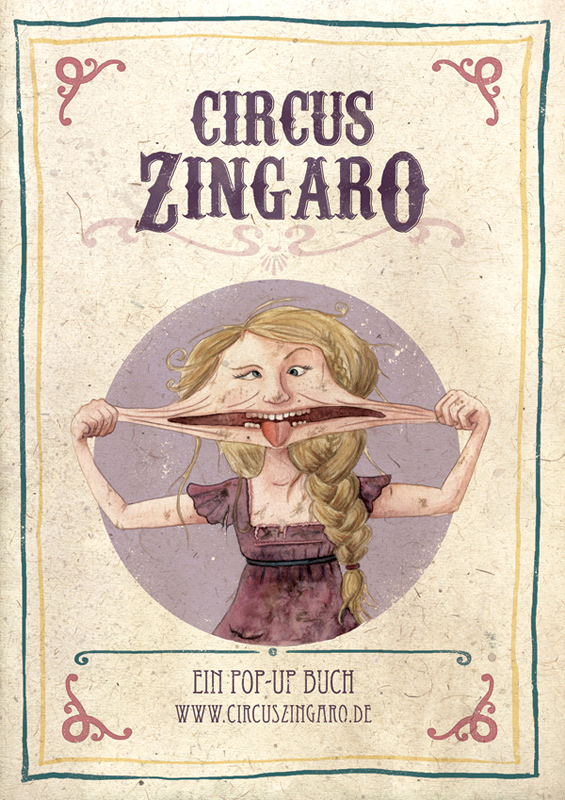 Tina, who also is an illustrator, did all the artwork for this book herself. Except for the first page, there’s no text at all in this book to tell the story. The illustrations do all the work and are so detailed and atmospheric that you get sucked right into the story. 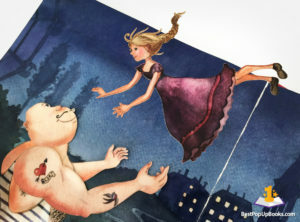 A story that looks and feels like a classic fairy tale written by Hans Christian Andersen. 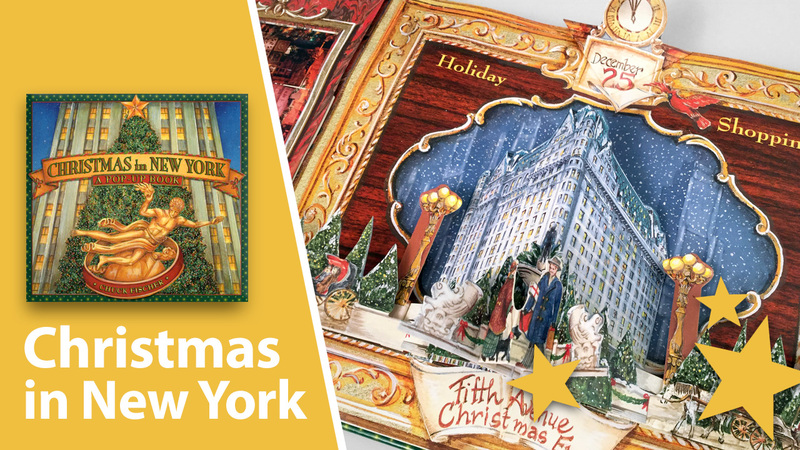 The vivid artwork is mostly watercolored and shows a rough canvas texture beneath what gives that extra artistic look. The illustration style is friendly and inviting, just like the characters in this book. 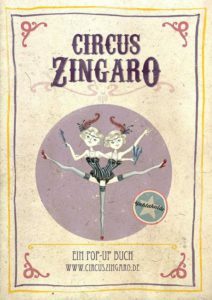 It’s also a bit dark and edgy but that makes a perfect mix of styles to create this colorful mysterious world of circus freaks, geeks and magic. We had the opportunity to ask Tina some questions about this book, a new project and her work as a Paper Engineer. Click here to go to the interview! For more information about the work of Tina you can visit her website and portfolio: faltmanufaktur.com. 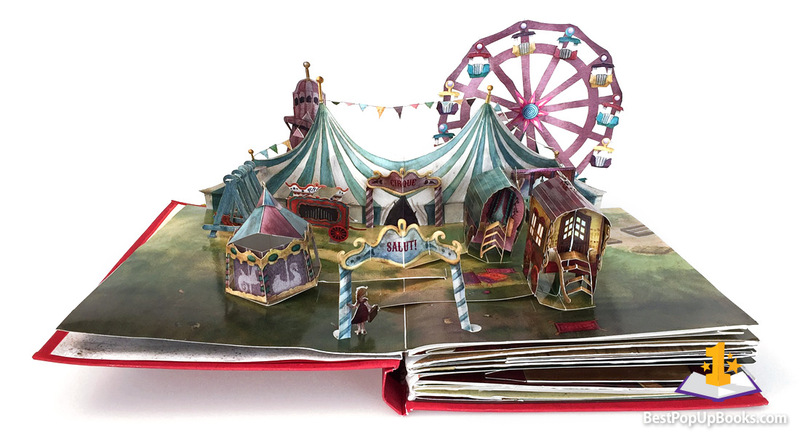 A beautiful pop-up book that creates a colorful and mysterious world of circus freaks, geeks and magic.